The Archive’s Carlos Osorio poses with the CDs containing more than 40,000 declassified documents. The National Security Archive posted a selection and analysis of 18 key documents from the release, as well as a timeline of Osorio’s 20-year effort to work towards the documents’ release. The records will provide a historical record that is highly likely to impact future efforts toward accountability in Argentina, provide long-awaited information for victims and their families, and advance the next generation of analysis and scholarship on the military era. 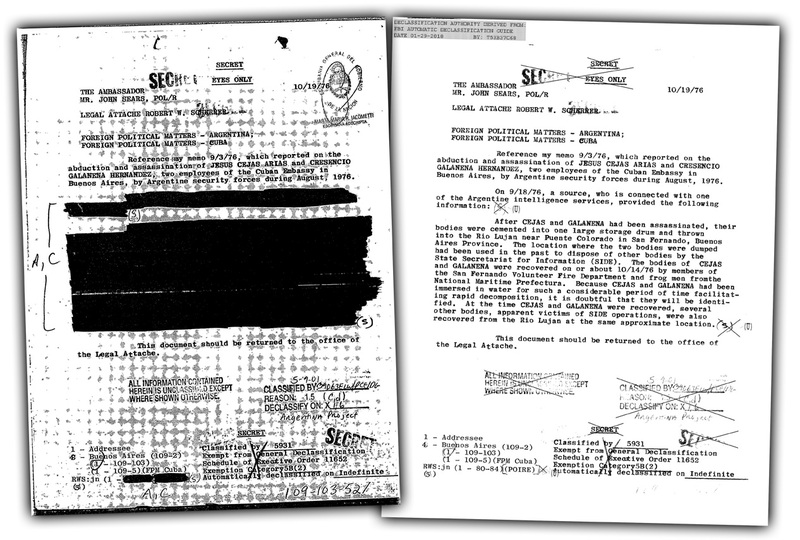 Left: a previously declassified, redacted version of an FBI report on the abduction and murder of two Cuban Embassy officers in Buenos Aires; right: The unredacted version released as part of the Argentina Declassification Project. South Korea’s bid to acquire nuclear weapons capability posed a complex challenge to the Ford administration during the mid-1970s, according to recently declassified documents published by the Archive. The South Korea case is of interest as one of several nonproliferation concerns at the time and for its illustration of the range of security, diplomatic, and political tests that have confronted different U.S. administrations in the nuclear sphere. Is Our National Security Past Too Sensitive to Make Public? On February 21 the Nonproliferation Policy Education Center held a conference discussing “Our National Security Past: Too Sensitive to Make Public?” with four expert presenters. William Inboden, Executive Director of the Clements Center for National Security at the University of Texas at Austin, addressed “The Perverse Incentives for Classification,” Richard Immerman, Director Emeritus at the Center for the Study of Force and Diplomacy at Temple University, remarked on “How the System of Declassification is Crashing,” Columbia University’s Robert Jervis addressed “What Factors Contributed to Ending the CIA’s 25-Year Document Review Program,” and Harvard’s Belfer Center’s William Tobey talked about “The Importance of Historical Documents for Current Policy Analysis.” The entire video can be enjoyed here. This week’s Cyber Brief highlights the Department of Defense Information Assurance Technology Analysis Center’s quarterly newsletter. Begun in 1997, its stated goal was to support U.S. information superiority efforts in accordance with the Joint Chiefs of Staff’s Joint Vision 2010 (JV2010) warfighting concept. The publication, which began in 1997, captures discussions and concerns about information security during and in the aftermath of events like Eligible Receiver 97, Moonlight Maze, and Solar Sunrise. Addressing representatives from the international diplomatic community, Osorio described his work over the past 15 years to collect tens of thousands of U.S. government records and to provide evidence in various Argentine legal forums. He recounted testifying for two days only two weeks earlier in Buenos Aires before the tribunal judging the Operation Condor Case, and analyzing for 10 hours the contents of a hundred documents from sources as varied as the CIA, Defense Intelligence Agency, State Department, the Paraguay Archive of Terror, and the Chilean former secret police, DINA. 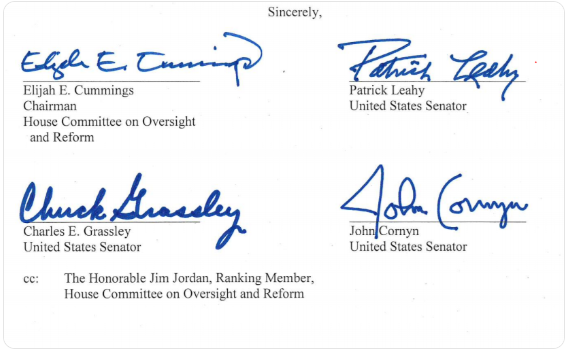 Representatives Elijah Cummings and Jim Jordan were joined by Senators Dianne Feinstein, Patrick Leahy, Chuck Grassley, and John Cornyn in sending a letter to the Comptroller General at the Government Accountability Office requesting the GAO “conduct a comprehensive review of agency compliance with the Freedom of Information Act.” The letter notes that “some agencies are not fully implementing the 2016 improvements and continue to burden requesters with unlawful delays and denials,” and cites a 2018 GAO report showing that 18 agencies have “implemented only half of the FOIA requirements” the report reviewed for. In their request for a comprehensive compliance review, the House and Senate leaders ask the GAO examine, among other things, how (if) agencies apply the foreseeable harm standard, and agencies’ use of FOIA’s Exemption 3, an expansive exemption that captures “the various nondisclosure provisions that are contained in other federal statutes.” The nondisclosure provisions are so numerous that they are a large part of the reason why the FOIA doesn’t effectively have just its nine statutory exemptions – it has more than 200 – including one about watermelon production data. Statutory exemptions give the DIA, NSA, DOD components, and others far more leeway to hide information than other agencies. The GAO request comes a month after Representative Cummings and Senators Grassley, Leahy, and Cornyn sent a stern letter to the Interior Department reprimanding the agency for its efforts to weaken its FOIA regulations and urging it to reconsider the rule change. The Knight First Amendment Institute at Columbia University and the ACLU are challenging the prepublication review system in federal court. The unique suit targets the entire system – which requires former intelligence and military officials to submit any fiction or nonfiction writing that relates to their government work to government censors for review to ensure no government secrets are disclosed – rather than a specific piece of writing. The plaintiffs argue that the system, which was initially limited to a select group of CIA employees but is now a routine part of obtaining a security clearance, is “dysfunctional,” ambiguous, and restricts free speech and due-process rights. In 2017 Congress mandated the Office of the Director of National Intelligence come up with a new system to streamline the prepublication review system to make it more uniform across the government and more timely, but no new policy has yet been announced. Arlington County and the state of Virginia both plan to give Amazon – which will be opening one of its HQ2 locations in the Northern Virginia suburb – notice when someone files a FOIA request concerning the company. The FOIA heads-up is part of “a $23 million incentive package the County Board unanimously approved last month to lure the company and its promise of at least 25,000 jobs to the county.” The deal gives Amazon at least a two-business day warning and potentially gives the company time to file a reverse-FOIA lawsuit to prevent the information’s disclosure. The county also doesn’t plan to redact FOIA requesters personal information before forwarding the request to Amazon. This week’s Cyber Brief focuses on the foundations of the internet – Cold War-era research and development performed by the Defense Advanced Research Projects Agency and researchers associated with the Department of Defense’s ARPANET. The six highlighted documents come from the Defense Technical Information Center and provide a glimpse into the research that made the internet possible. 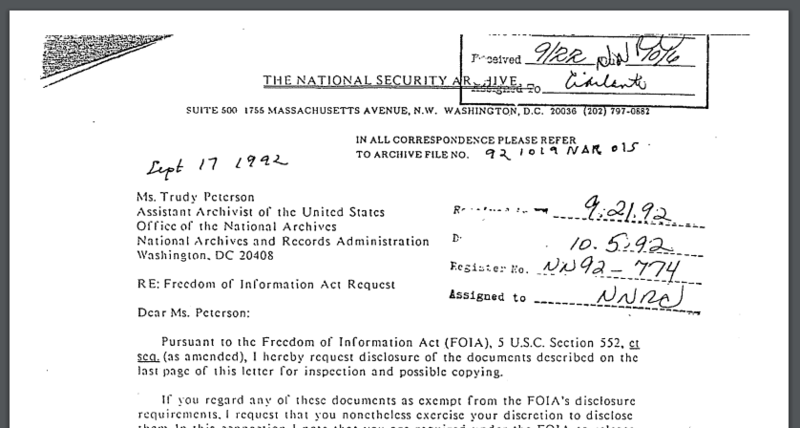 Oldest pending FOIA request govt-wide is even older than NARA reports. The Archive’s latest FOIA Audit showed that the oldest pending FOIA request government-wide is 25-years-old, that’s old enough to rent a car! Curious to see who it belonged to (and with a strong suspicion it was ours), we filed a FOIA request with the National Archives and Records Administration to find out. NARA recently responded with a copy of the request – filed in September 1992 even though NARA reports its oldest request is from August 1993 – that was filed by our very own William Burr. The request is still alive and kicking; Bill reports he received a document from this request last fall. The FOIA request was filed by the Environmental Working Group in November and sought records of testing done at 154 specific installations. The Army justified the fee by saying the request was too broad and would take 6,400 hours of work to complete – in other words, 160 work weeks. The Argentine government announced -on the 43rd anniversary of the military coup in that country- that the Trump administration will provide it with “the largest delivery of declassified documents” ever made available to another nation. The formerly secret U.S. intelligence records concern human rights abuses committed during the military dictatorship between 1976 and 1983. The documents come from agencies including the CIA, FBI, NSC, and Defense Intelligence Agency, and their official transfer is planned for mid-April during a visit by Argentina’s minister of justice, Germán Garavano, to Washington D.C. In support of the Argentina declassification project, the National Security Archive hailed the forthcoming document transfer. “We praise the Trump administration as well as President Macri for their concrete contribution to the cause of truth and human rights,” said Carlos Osorio, Director of the National Security Archive’s Southern Cone Documentation Project. The Archive will analyze the documentation and post a selection of the most significant and revealing records after the U.S. transfers the documents to Argentina. Thirty years ago today, the Soviet Union had its first real taste of democracy—its first competitive multi-candidate elections, which many people in Russia today still remember as the most free elections in their living memory. Contrary to popular perception, the first free elections in the socialist bloc took place not in Poland, but in Moscow following the decisions that were made at the XIX party conference held in June 1988. Although the Soviet Union still had a monopoly of Communist party enshrined in its Constitution, the electoral process helped define cleavages in the party and among the voting public, which later helped in the formation of the new parties. For the first time, candidates were free to campaign on their own platform and could nominate themselves without the party’s approval. Several candidates could be nominated for one seat, and even where only one candidate was nominated, people could vote for or against that candidate. Freedom of expression reached its peak in preparation for the elections where new revelations about “blank spots” of history, corruption, and party privileges were published every day and newspaper readership skyrocketed. As the results started to come in, people learned that the leading dissident Andrey Sakharov, who just recently was brought back from his exile by Gorbachev, was elected to the Congress, and that Boris Yeltsin, the reformer bounced by Gorbachev from the Politburo in 1987, won overwhelmingly as Moscow’s at-large candidate. Some 20 percent of party candidates lost –even with no opposition—including the top party leaders in Moscow and Leningrad. The Leningrad party chief drew only 110,000 votes while 130,000 of his constituents crossed out his name –a practice that would become epidemic in the June 1989 Polish elections. The party was shocked by its losses, the citizens were shocked by their success. Nobody quite knew yet how to govern the new processes and where they would lead, but Moscow was floating in a state of democratic euphoria, which is unforgettable to the people who lived through it. The following document shows how the ruling Politburo was trying to make sense of what has just happened. This weekly Politburo meeting from March 28, 1989 follows the March 26 vote for the USSR’s first popularly elected national Congress of People’s Deputies. The discussion features both Gorbachev’s positive spin and a thinly—veiled sense of shock on the leadership’s part. The new super legislature of 2,250 members—elected by 170 million voters—would meet from May 25 through June 9, elect a standing legislature—the new 542-member Supreme Soviet—and become the focus of national and world attention thanks partly to live telecasts spotlighting noted dissidents such as Andrey Sakharov in their extraordinary new roles as elected deputies. 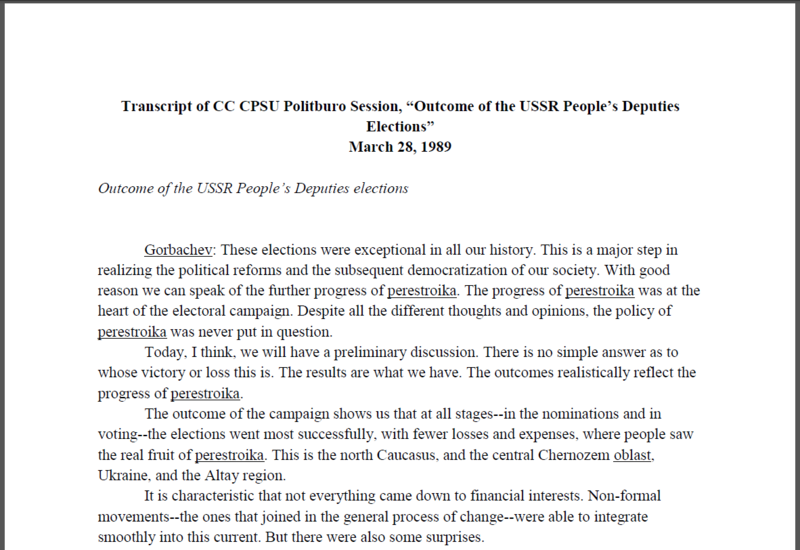 At this session, Gorbachev lays claim to achieving the Politburo’s goals of advancing democratization and successfully holding free elections. Yet there is a serious discordant note: the party was unprepared for the new democratic process it was trying to launch. As in Poland, the CPSU went into the elections without a sense of how dramatically it had squandered its legitimacy. In the short term, the new reformist Congress would strengthen Gorbachev’s agenda; but subsequently it would become a platform for the radical democrats. 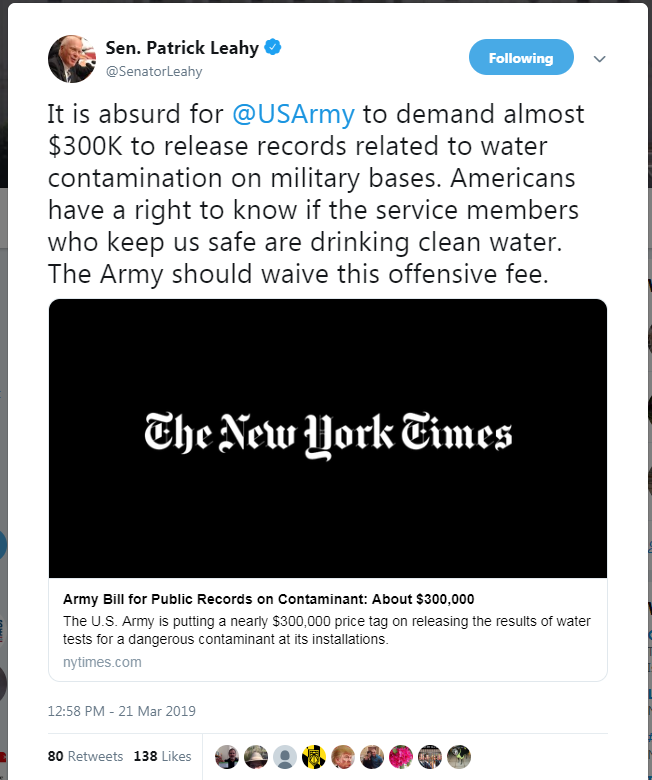 The Army is trying to charge a FOIA requester $300,000 to release the results of water tests at military installations for a dangerous contaminant that is linked to cancers and other illnesses. The news of the outrageous fee comes after deputy assistant Defense secretary Maureen Sullivan testified before the House that the DOD recently identified 401 military sites where the contaminants were used. A judge recently found the Commerce Department had “no legal basis” to charge $174,000 for access to government immigration data. A recent study using data from 2008 through 2016 found that, on average across the government, there are 188 FOIA requests per every FOIA officer. The study, which was published in the American Review of Public Administration and discussed at the most recent FOIA Advisory Committee meeting, contributes to a growing body of academic FOIA research, though quantitative studies necessarily weigh agencies’ self-reporting data at the expense of the less-quantifiable trends and attitudes experienced by requesters. She also discussed OGIS’ recent annual report to congress, which discusses agencies’ problems posting documents on their websites either proactively or after they’ve been requested three or more times, as required by the 2016 FOIA amendments. Many FOIA offices place at least part of the posting blame on making documents 508 compliant. (508 refers to a section of the Rehabilitation Act that has required agencies to ensure that persons with disabilities have comparable access to government information as persons without disabilities, and that federal employees with disabilities can access records with the same ease as their counterparts, since 1998). FOIA officers continue to cite 508 compliance as a hurdle in posting documents online, saying that sometimes agency IT shops don’t help FOIA offices make documents 508 compliant, so the burden falls on the FOIA office. There are, of course, work-arounds if making every single document 508 compliant (even though documents since 1998 are supposed to be born 508 compliant) is too burdensome. One is to post a 508-compliant index of all records released under FOIA in the FOIA reading room and allow those with disabilities to request individual documents off the index while the agency works behind the scenes to continue making all documents 508 compliant. A 2016 FOIA FACA meeting with a panel of representatives from the Access Board and the General Services Administration reinforced this practice, noting that some agencies like DHS do post non-508 compliant documents but provide a disclaimer and further instructions for individuals with accessibility issues on how to access the documents. And a recommendation from the FACA Committee in April encourages agencies to familiarize themselves with the Rehabilitation Act’s “undue burden provision” that allows agencies to post electronic documents that are not Section 508 compliant if rendering them compliant would “impose an undue burden” on the agency. Don’t miss the Archive’s Nate Jones’ article for the Nuclear Proliferation International History Project, “Is the Possibility of a Third World War Real?” In it, he “presents new evidence drawn from KGB documents and other eastern and western sources to examine Ukrainian and Soviet nuclear history. These new Soviet intelligence documents show the inefficiency of the early Soviet ICBM program; details of the domestic and international intelligence operations of the KGB; descriptions of Soviet decision-making and American manipulation of the KAL 007 civilian aircraft shoot down,” and much more. This week’s #TBT pick is chosen with the anniversary of the 2003 Iraq invasion in mind, and is a 2007 posting from our Iraq Project director Joyce Battle on the media war plan. 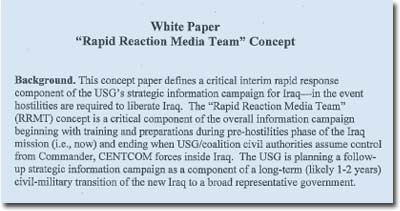 It highlights a White Paper and a PowerPoint obtained by the Archive through FOIA that recommended the creation of a “Rapid Reaction Media Team” to serve as a bridge between Iraq’s formerly state-controlled news outlets and an “Iraqi Free Media” network. This year’s House Committee on Oversight and Reform Sunshine Week hearing was a strong showing of bipartisan support for FOIA and a desire to address the shortcomings in its administration. Rep. Cummings receiving his well-deserved award for fighting for the public’s right to know. In his opening remarks, Chairman Elijah Cummings (D-Md.) pinned deserved attention on the Justice Department, which is responsible for “encouraging” government-wide FOIA compliance and defends agencies in court when sued under the statute. 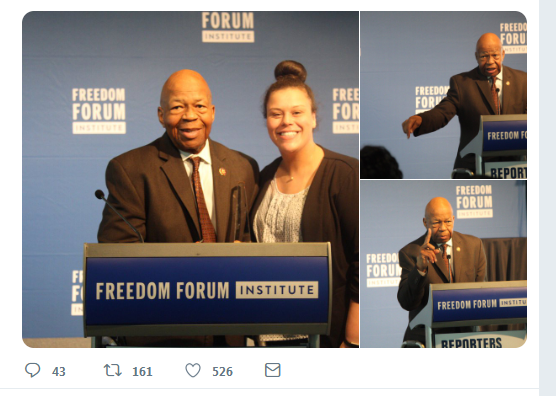 Rep. Cummings said, “In my opinion, DOJ needs to do a much, much better job because we are seeing far too much information being delayed and even withheld” (he expressed the same sentiment when receiving the 2019 Sunshine in Government Award at the National FOI Day Conference). The witnesses at the hearing were the Director of the Justice Department’s Office of Information Policy, Melanie Pustay, Acting Director of the National FOIA Office for the Environmental Protection Agency, Tim Epp, and the Acting Deputy Chief FOIA Officer from the Department of the Interior, Rachel Spector. None had an easy day of it. The Archive audit charts agencies oldest request, their backlog, and average processing time for “complex” requests. Another recent FOIA request shows that Interior’s Bureau of Safety and Environmental Enforcement issued 1,700 waivers to an Obama-era offshore oil drilling rule that was issued in the wake of 2010’s Deepwater Horizon oil spill disaster. This is not the first time the FBI has been caught impersonating a journalist. It was widely reported that in 2007 the FBI ignored its own rules impersonating an AP journalist, and then deemed the rule-breaking reasonable when it came to light thanks to a FOIA lawsuit brought by RCFP and the AP. The bizarre story began in 2007 when the FBI created a fake story on bomb threats made at a Seattle-area high school, attributed it to the AP, and then sent it in a private MySpace message to the student suspected of making the threats against the school. “By clicking on the link, the suspect unwittingly downloaded a piece of malware, a computer bug that enabled agents to identify his Internet protocol address.” Documents obtained from the suit include details on the “sensitive circumstances” that must be met for an undercover agent to impersonate a member of the news media. The FBI is not the only law enforcement agency that impersonates people on social media in controversial ways to further its investigations. In 2014 a Drug Enforcement Agency (DEA) agent impersonated a young woman on Facebook, posted racy photos of her and pictures of her underage son and niece on the social media site, all as part of a drug investigation. Don’t burn down the Archives! Read to the end to learn about the strangest thing Fort has discovered in his work – a find that required a call to the local police department! Representative Elijah Cummings, D-Md, and Senators Chuck Grassley, R-Iowa, Patrick Leahy, D-Vt., and John Cornyn, R-Texas, recently sent a stern letter to the Interior Department reprimanding the agency for its efforts to weaken its FOIA regulations and urging it to reconsider the rule change. The proposed rule change – which garnered more than 65,000 comments – include allowing the DOI to preemptively reject what it defines as “unreasonably burdensome” requests, the possibility of imposing a monthly limit to the number of either pages or requests from a single requester the agency will process, and a host of other changes that may make it more difficult to obtain fee waivers and expedited processing. The National Security Archive’s 18th Freedom of Information Act Audit is coming soon – with disappointing results of a government-wide survey intended to see how much progress agencies have made closing their oldest requests. A 2011 Archive Audit found eight federal agencies have FOIA requests a decade old – and the results now are no less concerning. CIA Director Allen W. Dulles made a bid in June 1961 for this “Special Group” to have an autonomous ability to approve covert operations (Document 1). In early 1962 the CIA’s top lawyer relied upon presidents’ Article 2 powers under the Constitution, and on the notion Congress approved by appropriation, to justify covert operations. He warned that no statute actually authorized covert operations (Document 4). President Kennedy’s brother, Robert F. Kennedy, in March 1962 brought up personal characteristics and known acquaintances of Fidel Castro as things which could be exploited in efforts to neutralize the Cuban leader (Document 6). This week’s TBT pick comes from 2007 and presents the declassified documents introduced as evidence during the trial of Vice President Cheney’s former chief of staff, Lewis “Scooter” Libby. Archive director Tom Blanton discussed the documents with NPR’s Morning Edition, annotating a series of trial exhibits including several in Mr. Cheney’s own handwriting, ranging from his scribbles on a New York Times op-ed piece critical of the administration, to his tasking of the White House press operation to defend Libby against charges of leaking classified information.